On a light rainy day at the end of January, we traveled to Kyoto to visit the Kyoto Museum for World Peace, Ritsumeikan University. There were eight of us in all: four WFC board members, four Hiroshima Pass-on-Project lecture participants. At Kyoto station, we were met by Ms. Yoshiko Tanigawa, a volunteer guide from the museum. She led us to a bus on which we headed for Ritsumeikan University at the foot of Mt. Kinugasa. According to her explanation, of its type as a university-established museum, it is unsurpassed in the world as regards its scale and exhibits. We were excited, looking forward to seeing all this. At first we visited Suekawa Memorial hall, named after the honorary president Hiroshi Suekawa who was from Iwakuni. Mr. Suekawa’s relics exhibition was held there. There Ms. Rumi Hanagaki greeted us. She was exposed to the atomic bomb in Yokogawa at the age of five years old. Now she is a caretaker for the Kyoto atomic and hydrogen bomb survivors’ consultation group. After lunch at the restaurant in the hall and introducing ourselves, we heard Ms. Hanagaki’s testimony as a hibakusha. She said that the circumstances at the time of exposure to the blast, especially what she experienced while evacuating to Mitaki had returned to her years later as flashbacks. Moving to the museum next door, the roses of Anne welcomed us at the entrance. Entering the building, there was a comfortable spacious lounge. 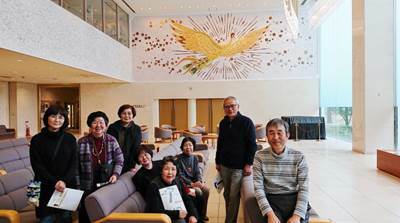 On the east and west walls, two “Phoenix fire birds” reliefs by Osamu Tezuka representing the epidemic of past war to bright future were glowing lustrously, and we were met by the impressive enshrined Muchan Peace Statue. Ms. Tanigawa explained that Muchan was a girl with tuberculosis who had been kept quarantined alone in a shelter, and had starved to death without knowing that the war was over. Then finally we went to the lower first floor to the main permanent display, “Staring at Peace”. The exhibition starts when you go down the stairs looking at the large Wadatsumi (God of the sea) statue along one side. The exhibits on this floor were divided into two themes: the “Fifteen years war” and “Modern wars”. For the “Fifteen years war”, there was a huge display of primary materials with easy to understand neutral explanations based on historical facts. I was deeply impressed. I was able to learn a lot of things which I hadn’t known. This museum was established following deep reflection on the fact that Ritsumeikan had been a strongly militaristic school before the war. Everywhere I saw the strong intention to nurture the subject of creating peace. Contents of the respective exhibitions were significant. The themes were: ① Military and soldiers (Characteristics of the imperial army), ② General public mobilization (War cooperation system), ③ Colonies and occupied territories (Anti-Japanese movement), ④ Air raids, the Battle of Okinawa, the Atomic bomb, ⑤ Efforts for peace (about the Japanese antiwar movement), and ⑥ Responsibility for war. Among the exhibits that remain strongly impressed in my memory are the heavy backpacks, up to 30kg, which the soldiers carried, an aerial photograph showing the plan to drop the atomic bomb on Kyoto, which had been among the first possible targets (a circle with a radius of 2.4 km from the Ume alley engine depot), and anti-Japanese slogans. Then we went upstairs and looked around the “Peace Creation Exhibition Room”. Here, one area for reflecting on violence and peace was introduced, around the central theme of “Peace is not just the absence of conflict”. I became aware of the various issues that exist around us. In the next room was an exhibition of works from art students who died in the war, kept in this Kyoto Hall section of the “Silent Hall” museum located in Ueda City, Nagano Prefecture. I faced the works of the art students who had lost their lives so young. In this visit to the Kyoto Museum for World Peace, Ritsumeikan University, through the huge display of exhibits built on academic knowledge, I was able to gain some understanding of the stupidity of war and a realization that peace can be achieved through the proactive behavior of individuals. It was a very meaningful tour for our future peace activities. Finally, I wish to express my appreciation to our guides, Ms. Tanigawa and Ms. Hanagaki, and to every member of the board of the World Friendship Center. My daily experiences and realizations led to seeing Hiroshima through an outside perspective and to think of “peace” in broader ways. It also became a trip of self-discovery. The sculpture placed at the University of Chicago where the world’s first nuclear reactor was, and the exhibit at the United States Air Force Museum both seemed to showcase the American narrative praising the achievement and development of nuclear power to this day. A statement from a Chinese man at Illinois Wesleyan pointed out the atrocities done by the Japanese imperial army to the Asian countries during WWII. Each with its own story and historical memory, how could we communicate with our eyes collectively toward the future and take steps toward peace? How should our generation pass on the history of Hiroshima? At the Peace Conference at Illinois Wesleyan, I learned about the present state of those who need “peace” in the world due to conflicts, hate that goes back in history, income disparity, racial and sexual discrimination, etc., and of the works people are doing to better these situations. So what is “peace”? Is peace different for each individual? What are the commonalities? These are all questions I don’t yet have clear answers for, but ones I was compelled to ask and bring home. I wish to seek answers for these questions as I gain knowledge and hopefully wisdom. There were two things in particular I’ve noticed through our activities. First was the several class visits we did at universities. There, we mainly spent time with questions and answers rather than a one-sided presentation. I noticed an active participation along with direct connections with the students that were very meaningful. Second was the power of art. In my presentation I gave a brief introduction on the project, the “Grandchildren of Hiroshima.” Then there was Amano-san’s one-man drama, “Living with Father.” I realized again that art is one effective avenue that possesses an unique strength in telling the story of Hiroshima. Neither race nor nationality mattered when it came to the power that moves people and naturally leads their heart to empathize as human beings. Above are the two points I’d like to learn from and utilize in the future. Our presentations were aimed toward university students and older this time, but I’d really like to reach a wider generation of people next time, and hopefully through many avenues including culture, history, testimonies, and art. I hope this would lead each one of us to consider nuclear issues as a humanitarian problem which we face today. Each day was like opening up a new present. In two occasions I experienced a surprising yet a delightful reunion when a woman came up to me and told me she had known me as a baby. 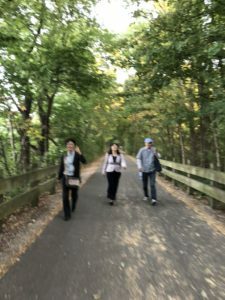 What I’ve realized through meeting many people and having many people take care of us is the importance of communicating, understanding, and connecting; to make a friend. I strongly felt there lies the foundation for peace. Dan from the Brethren Volunteer Service and his wife, Wendy: Thank you for your overwhelming generosity. Through our nightly conversations, you gave me many new perspectives. Bagels, bacon, to the best coffee. You made my little American dream come true. We couldn’t have asked for a better way to begin our trip. Josie from Illinois Wesleyan: Thank you for organizing the wonderful Peace Conference that led to so many irreplaceable connections and learning. I sensed a deep gratitude and importance of growing through learning. I loved talking with you about issues surrounding us as human beings and as women. Tanya from Wilmington: Thank you for giving us the opportunity to experience and to ponder peace from various perspectives. I admire your quiet strength that continues to burn inside your gentleness. And thank you for all the food that were probably-the-best-ever-I’ve-had in-the-states. Thank you also to the Snyders for helping me see the need to consider the present issues through our past history. Special thanks to the delicious homemade desserts and the extra bacon. Alice from Bluffton: Reuniting with you after I don’t know how many years and spending your 89th birthday with you was amazing beyond words. Thank you for pouring love on me unchangingly since I was little and even now. Unsurprisingly, surrounding you was a community built on love and it felt as though I caught a glimpse of what peace needs to be founded on. To my fellow PAX members: Thank you for every moment spent supporting each other with our quirky personalities and for all the laughter. Lastly, I’d like to send my deepest thank you to the people at WFC who have always watched over me and for making me a part of this incredible opportunity. Picture: I’m sorry the picture is out of focus. These are my 3 fun travel companions taking a walk and singing rather loudly into the woods! I joined PAX Tour to America from September 17th to September 28th as one of 4 PAX members. 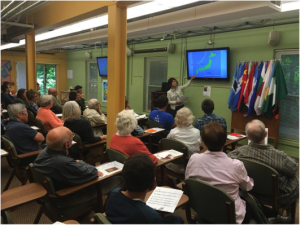 We visited 4 places: Elgin and Bloomington – Normal in Illinois; Wilmington and Bluffton in Ohio, to make presentations about peace. The experiences of having met a lot of people with volunteer spirits in America changed my understanding of volunteerism . I learned that family units in America are open to society and people naturally work for the community as volunteers. It seemed that volunteering work are not hard obligations but delightful opportunities for each of volunteers to help people with needs. They seemingly valued individuality. I was invited to make my presentations, including short self-introductions, at least 12 times in all during the tour. Although I was not sure if I could make my presentations understood because of my clumsy English, I was very impressed that the people I met in America tried to sincerely listen to and understand my presentations about peace. Thinking back on my presentations, each opportunity was so precious to me, even if I was not satisfied with my poor English. As the length of this paper is limited, I am not able to introduce every presentation and what happened in this tour, but here I would like to write about the very impressive one, the panel at Illinois Wesleyan University on September 22nd.. It was so impressive because during that 2-hour panel I had been so nervous, had felt uneasy and had been very moved by the presentations of the other panelists. I was aware that the other panelists could speak near-native English and had been very experienced with peace issues. On the other hand, I believed that the heart of my idea about peace (the title was “the Spirit of the Memorial Cenotaph for Atomic Bomb Victims” ) was connected to theirs and those of each of the persons working for world peace. About 30 minutes before the panel was finished , one Chinese man from the audience had very strong comment on my presentation, blaming the Japanese people for atrocities in China during WWⅡ. I apologized him for the Japan’s atrocities and explained the idea of my presentation, quoting the words of the former Hiroshima Mayer Shinzo Hamai: “There is no winner and no loser in a war. The cenotaph exists for mourning the dead and taking an oath not to bring about wars”. I don’t know if my response was persuasive to him and I also hope my response was understood by the audience. I remember the moment when I was relieved to hear the clapping of hands from the audience. I appreciate all the people who were involved in organizing this PAX tour and those who hosted us PAX members for giving us this precious opportunity. I had a chance to participate in the PAX-USA 2018. It all started last April when Yamane-san, the WFC chairperson, asked me if I would like to perform the one-man play, “Living with Father”, in the U.S.A. I had already performed the play with English subtitles before the WFC members, including the co-directors. I agreed to the proposal with pleasure. It would be a precious chance for me to perform the play about the A-bomb on Hiroshima written by Hisashi Inoue, a prominent Japanese playwright. I was nervous because I had no confidence in my English, but thanks to the strong support of the other PAX members (Mimura-san, Nishi-san and Tashiro-san), each of my performances at four places ended in great success. I am really grateful to each person who gave me a helping hand. During the tour, everywhere we went, the local people gave us a warm welcome. A lot of people helped us out. Before the performance at the Church of the Brethren in Elgin, Illinois on September 19, Dan was busy setting up the equipment to the last minute. On September 20, at Illinois Wesleyan University in Bloomington, Josie was a key person and a college professor there worked as my translator. The theater was filled with laughter and tears, and they gave me a standing ovation. While there, Raymond G. Wilson and his wife Akiko gave us three panoramic photos of Hiroshima after the A-bomb, which we, in turn, later passed on to Dayton International Peace Museum, Alice Ramseyer, and the WFC. Tanya of Peace Resource Center kindly climbed up a ladder for us to set up the lighting equipment at Wilmington College in Ohio on September 25. Our host family, Christine and Gene Snyder and a large number of local people and college students came over to see the play. On September 29, there were many local people at the First Mennonite Church in Bluffton, too. Barb’s brother Ken was there. Alice, who celebrated her 89th birthday, was there and vigorously took care of us. Looking back on this PAX tour, I must give my thanks to all the people I met who guided us, who let me stay at their home, who came to see my play, and to each fellow PAX member. I must thank the people of the WFC who gave me this precious opportunity. Thank you. I will make use of my experience of this tour to tell the message for peace through my future performances. I aim to learn more about what happened in Hiroshima and Nagasaki after the A-bombing, and how people, such as WFC founder Barbara, have endeavored to abolish nuclear weapons for world peace. I will try to pass on this history to the new generation. In this, I look forward to your assistance. Again, thank you very much. I applied to join American PAX at the end of June. It was privilege for me to be chosen as one of the participants and to have such a precious experience. We visited four places and met many people who welcomed us. I think that the warm welcome was only thanks to the years of relationship cultivated between each person or group and the WFC. I deeply appreciate the organizers and WFC committee members for working kindly to preparing our trip and give accurate information. I also thank each host family for accepting us, and making delicious breakfasts! The first place we visited was Elgin, northwest of Chicago. A director of this church, Dan Mcfadden hosted us and gave us a guided tour here. The headquarters of Brethren Church is here, their publishing department is here, too. The book “Sea-going Cowboys ” was published here. One of the works they undertake here is Brethren Volunteer Service. After a couple weeks of training, volunteers are dispatched all over the place, in the USA and overseas. 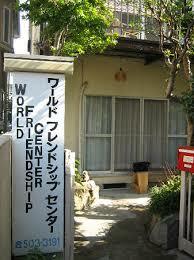 The WFC co-directors, Dannie and Barb were also sent to Hiroshima from here. 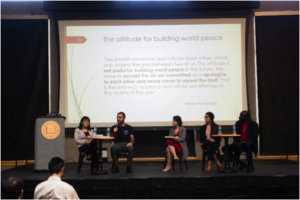 In Illinois Wesleyan University, we participated in the International Peace Conference, held over International Peace Day on September 20, 21, and 22. Josie, one of the interns at the WFC last June, was a leading organizer for this conference. We visited several classes from the first day soon after we arrived there. In each class, after we introduced ourselves, students asked us some questions related to Hiroshima and the atomic bomb. It was a good chance for us to know how they think about A-bombing. In this university, we saw that students learned seriously about Hiroshima. But those questions were not so easy for me to answer smoothly without preparation. I felt sorry about my poor English. My presentation here was held from 6.30 in Turlfer room, with dinner and a small panel discussion. Hank Campbell was the following speaker panelist who works to make bridges between Jewish Israelis and Arab Palestinians. When I was nervous, my PAX pals sat in the front row and said they were there for me. That helped me relax. During this trip, I had a lot of experiences with the other participants – joking, singing, chatting and discussing. In my presentation, I talked about the WFC and some victims of the A-bomb in my husband’s family. In Wilmington, we visited Tanya Maus at the Peace Resource Center. In the evening we were welcomed by local people with a potluck party. I felt this community has a close relationship with college. I learned that the number of Japanese books related to nuclear here is the largest outside Japan. At Bluffton University, director Louise Mattheu gave us a campus tour and showed us some art on the campus. I felt their strong will to convey peace through the arts. There was also a cozy library in the Peace Center, the Lion and Lamb, where schoolchildren learn about peace through the “Sadako” or “Swords to Plowshares” stories. Our presentations were held in this center. Because one of the organizers, Alice Ramseyer, announced this through the local newspaper, many people in the local community people came, as well as a few students of this university. They seemed to learn about Hiroshima and the bomb. Most people we met through this PAX visit were relatively knowledgeable about Hiroshima. Still, though, the U.S. is one of the nations which possesses a large amount of arms, especially nuclear weapons. It might have been a small step for me to join PAX, but connecting with each other makes us stronger. Thank you again for all the people I met in the U.S.A and the WFC.